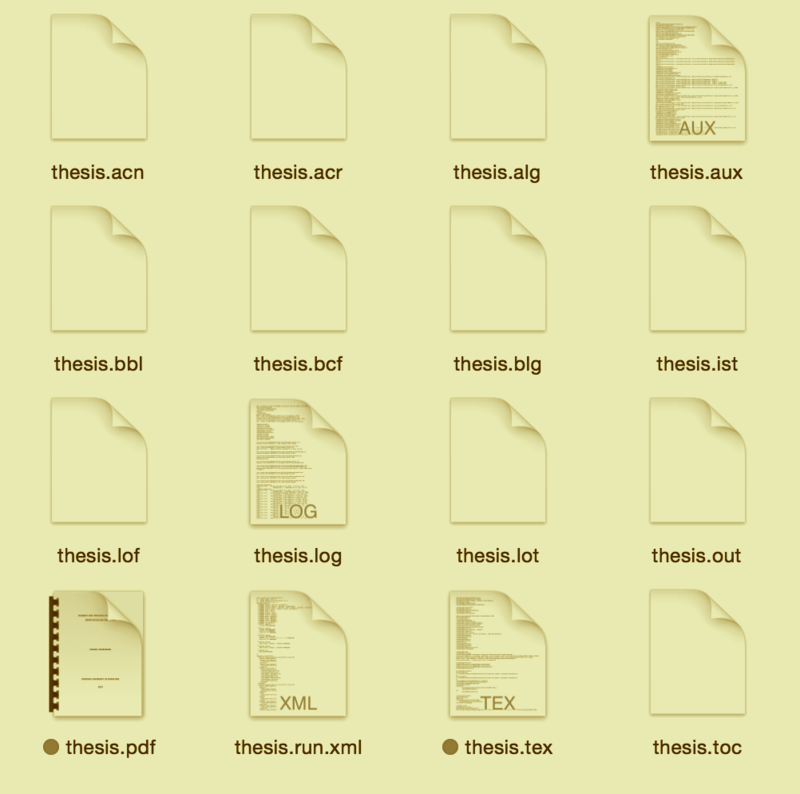 While writing a thesis or working on a large project, the number of files in the main project directory can be overwhelming. A number of metafiles are generated by LaTeX itself, for glossaries, or for bibliographies. Often, the author doesn’t touch these files. In this article, I discuss a neat way to hide these files in a separate folder, in order to reduce clutter in the main project folder. The idea is to create a folder for metafiles in the main project directory and place all meta-/output-files in that folder. As a consequence, the final PDF will also be generated in that folder, even though we would want it in the project directory. I’ll show how to typeset a document while keeping all metafiles in a separate folder. Moreover, I’ll provide a solution for how to have the final PDF in the main project folder. One way to generate a glossary or list of acronyms is to use the glossaries package. The package also installs a perl script makeglossaries that simplifies the glossary generation through makeindex. See the glossaries package documentation for more details. Similar to pdflatex and biber, a parameter can be specified to tell makeglossaries where input files are located. Finally, I want to have the output PDF file in my project directory, rather than in the metafiles folder. There are two possible ways. Either I simply move (mv) the file out of metafiles or I create a soft-link in the project directory, pointing to the actual file. The scripts are written in bash and are likely to work on Linux/UNIX-based systems, including Mac OS X. There are other ways to do the same thing, for example using latexmk or Snakemake. Also, since I’m not working with Windows, I wasn’t able to provide a command-line script for Windows users. Feel free to post your script below for others to use. Source: The idea for this post and some of the code was taken from here. On Windows you can use pdflatex -aux-directory=... that removes the necessity for moving the output pdf. Thanks, I wasn’t aware of that option. It seems this is only available in MiKTeX. Here’s a bash script which you can add to your path. The script requires a single argument: the name of the latex source file. I haven’t included any of the bibtex etc. as I don’t need that at the moment. ME="$(basename "$(test -L "$0" && readlink "$0" || echo "$0")")"
Thanks for your feedback and the script. I appreciate it. Tom. Hi!, great blog, I would like to translate this and some other post into spanish. Could I get your permission? Of course, I will cite your base blog url and a link to the post. Sure, feel free to use the information on my blog. Thanks for asking! Although this still works, meanwhile the build tool ltx2any was developed. It does all of that automatically.